For semi-truck drivers, it may seem almost impossible to maintain a healthy diet and eat nutritional foods while out on the road. However, by following a couple of strategic tips and adding in a little planning, healthy snack ideas for drivers are endless. Fuel stops and fast food really aren’t the only options! Remember that food is fuel. You wouldn’t put bad fuel in your tractor, so don’t put bad fuel in your body. Carry your own food and cook in your semi-truck. Don’t depend on truck stops. Think color. Eat a wide range different colored foods. Always make the ‘best choice’ possible. Sometimes there is no ‘good’ food choice, but there are better choices than others. 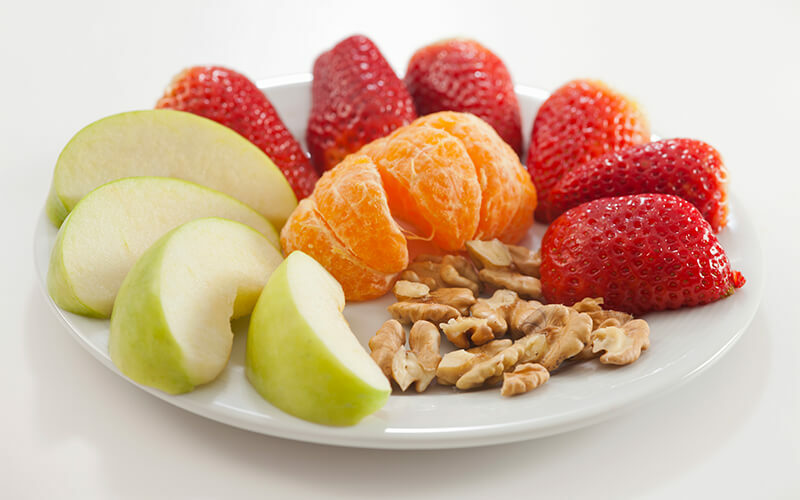 Eat 4-6 small meals (or snacks) versus one big meal per day. Look for foods that have at least three grams of fiber per serving. Apples, berries, bananas, oranges or tangerines, cantaloupe, figs, grapes, watermelon and apricots are all good options. Some fruit may require extra storage or preparation, like cutting and storing in smaller units. Dates and raisins are great died fruit options, but be careful of the calories; limit your quantities. Figs, prunes and dates have the most fiber content with 12-14 grams per cup. Veggie options are endless: carrots, celery, broccoli, cauliflower, cucumber, snap peas, cherry tomatoes, peppers (yellow, red, green) and even edamame (soy beans). Celery with hummus (pureed chickpeas) makes a great snack. Prepare your pre-cut veggies at home or in your truck and store in snack size zipper bags. Tuna, salmon, sardines and mackerel are packaged in individual serving size containers and don’t need to be kept cold. Fish is all protein and high in heart healthy fats. Choose light and low sodium cheese sticks like mozzarella-based ones. They are high in protein and calcium, but can also be high in calories. Walnuts, almonds, pistachios, soy nuts, macadamia nuts, pecans, sunflower seeds, etc. are all good options, but watch the salt. Choose un-salted if possible. Peanuts are good, too, but contain less protein and more carbohydrates compared to other nuts. Pair with a cheese stick for a super snack. Choose a brand with whole grains, high protein (10 grams), high fiber (4-5 grams), low sugar (less than 13 grams) and moderate calories (200 or less). Hard boiled or egg substitutes are easy to store and easy to prepare. Pre-peel your hardboiled egg to save yourself the mess when eating. Precook real eggs or egg substitute into scrambled egg patties, add some veggies and heat up when you’re ready to eat. Yogurt-based smoothies will need to be kept cold, but they provide a nutritional punch and include calcium and protein. There are many pre-packaged, commercial brands that can be found at grocery stores, or you can make your own with some of your favorite fruits. Beef and turkey jerky are easy to eat, contain protein and taste good. Choose low sodium options (less than nine grams per ounce) and avoid ‘sugared’ variations. Soup is a great way to get nutrition. Heat up your soup, put it into a thermos and it will be ready when you are. Choose low sodium and homemade options. Black bean, split pea, lentil and minestrone soups are packed with nutrients, protein and fiber. Munch on high fiber cereals, like Oatmeal Flakes, Oatmeal Squares, Raisin Bran and Shredded Wheat. Stick with types that are low in sodium and low calorie. Low/no butter and no salt microwavable popcorn is the way to go. Eating healthy while out on the road does take extra planning and prep work, but new Schneider trucks have equipment like refrigerators that help make it a bit easier. Buy your groceries ahead of time, pack them into your cooler or mini fridge and you’ll be good to go. Care for your body as much as you care for your truck. Schneider knows how important it is for drivers to be comfortable while operating their truck. We continually invest in new equipment, like factory-installed refrigerators, so drivers are happy and healthy while out on the road. Sue has been an Atlas physical therapist with Schneider at the Edwardsville, Ill. operating center since 2006. She attended the University of Florida and coordinates the monthly educational health and wellness newsletter for Atlas. Outside of work, Sue enjoys golfing with her husband, walking her dog and gardening.